Work In Progress Blog Hop: The Next Big Thing! 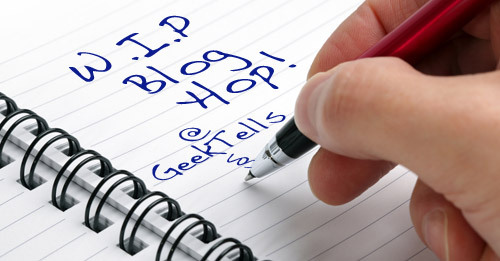 So there’s this thing called a blog hop, sort of an informal ring of unrelated sites posting on a related theme. In this case, the blog hop is for writers and the theme is our work-in-progress, meaning the book we’re writing. I found out about it from Diane Carlisle. • Answer the ten questions (see below) about your current W.I.P. (Work In Progress) on your blog. • Tag five other writers/bloggers and add their links so we can hop over and meet them. Many years ago, I set out to write my first short story. I finished the story, but it stuck with me and I started thinking about the back story, the broader world, and just what the heck was on that data cube?! Mason Truman is a PI whose easy missing persons case puts him in the path of dangerous AIs, a gluttonous corporate monstrosity, and Miranda, a new kind of AI who believes she can see the future; worse yet, she thinks he’s the lynchpin to saving humanity. I am seeking agency representation even now. Like all writers, I’m trying to clamber atop the shoulders of giants. I’ve been trying to answer this question for more than four months (when I started querying), and the two books that spring to mind most frquently are Larrry Niven’s Ringworld and Dan Simmons’s Hyperion books (if they starred James Rockford of The Rockford Files). Poker’s Black Friday coupled with simultaneous burnout for World of Warcraft got me in the right frame of mind to finally write this book. On a broader level, I’ve wanted to write fiction for much of my life because I’ve been so inspired by the works of people like George R.R. Martin, Dan Simmons, Frank Herbert, Larry Niven, J.K. Rowling, Katherine Kurtz, and a vast host of other writers. If I can write something on the order of two percent as good as the works that have inspired me, I’ll be a happy camper. The thing I enjoy most about this story is exploring the role of artificial intelligence in our not-too-distant future. Will they be partners? Slaves? Masters? Would they live lives that are completely independent of what we consider reality? Will they have their own agenda? Their own personalities? How might political power evolve around the emergence of such beings? What would their goals be? Their hobbies? What happens if they aren’t all on the same page? This forms the backdrop to my tale, and it’s the practical effects of these ideas that confront my main character (who is human). Have a W.I.P? Answer the questions above, post it on the Interwebs, and send me a link. I’ll add you to the list below. This entry was posted in Blog and tagged Books, Mason Truman, Writing by Bryan Chaffin. Bookmark the permalink. Ha! Thanks, Diane. And thanks for showing me this blog hop, too. Putting my entry together was helpful for my own process, but I also found reading other people’s to be very interesting.